Casino Royale romped away with the #1 spot at all 27 international box-offices on opening weekend, but narrowly failed to scoop the illustrious top-spot in the USA. In its second week of release, the film was #1 in 40 out of 50 countries, but again missed out on the top position in the USA. The film taken over 2002's "Die Another Day" record as the most successful Bond film at the box-office. Above: Daniel Craig's debut outing as 007 smashed Bond box-office records in the UK. Variety reports that the UK enjoyed a record-breaking opening for Bond. Driven by very strong reviews and positive buzz surrounding the gritty performance of Daniel Craig, Bond had a sensational opening in Britain, taking $25,355,355 at 988 screens (£13.37 million). This included Thursday previews of $3,696,398 (£1.7 million) - shattering the existing box office record for the debut night of a new James Bond adventure. The last Bond film, Die Another Day, took £1.1 million on its opening night in November 2002. The $21,658,957 three-day opening figure was the third biggest opening in U.K. box office history – trailing only "Pirates of the Caribbean: Dead Man's Chest" in 2006 and "Harry Potter and the Goblet of Fire" in 2005. The four-day opening easily smashed the record for a Bond opening in the U.K. Pierce Brosnan's final outing as 007 in "Die Another Day" took $17.2 million (£9.1 million) in its first five days on release in 2002. "We are delighted the U.K. has had record-breaking results over the weekend... and we are very grateful for the support and goodwill of the British public to the new film and most especially towards Daniel Craig," said producers Michael G. Wilson and Barbara Broccoli. Week 2 - Casino Royale's best country per capita continued to be the United Kingdom, where it had a sensational $16.3 million second weekend. It was only down 25 percent on its opening weekend total, holding better than James Bond's previous outings including, GoldenEye, The World Is Not Enough and Die Another Day, which each fell over 31 percent. With $53.3 million in the till, it will likely surpass the previous Bond, Die Another Day, by next weekend. Week 3 - Casino Royale remained at the top spot at the UK box-office, pulling in $14,710,452 over the week in 506 venues (an estimated $10.5m of which was at the weekend), bringing the total UK haul so far to $77,623,116. Casino Royale has already become the second highest grossing movie of the year in the UK. Week 4 - Casino Royale remained at the #1 spot in the UK for the fourth consecutive week since release. The film took $5.43 million over its fourth weekend, bringing the UK haul to . The film fell from the top spot to Happy Feet after the weekend. Week 5 - Casino Royale secured third place despite some new releases with a $2.9 million sixth-weekend. Daniel Craig's debut as James Bond opened huge and has now banked an impressive $82.5 million, well clear of previous Bond franchise best performer "Die Another Day" in 2002, which finished up with $69.6 million. Bookers forecast a $98 million final UK cume for "Casino Royale," which is expected to play well over the Christmas holiday season and into January. Week 6 - Jumping up to second place at the UK box-office during Christmas week, Casino Royale took $4,627,589 over 428 engagements. Week 7 - Casino Royale jumped up 6% thanks to a good performance through the holiday season, taking $4,915,759 over 377 engagements, finishing #3 at the UK box-office for the week. The film's cume stands at a tantalising $99,338,848. Week 8 - Casino Royale finished at #4 after eight weeks on release and a 40% dip in takings, bringing in $2,922,022 from 334	engagements. The film's cume broke into 9 figures for the first time for a Bond film in the UK, with a total of $100,850,441. Over the past 5 weeks, Bond's box-office rival in the USA - "Happy Feet" - came and went with a total run of only $31,922,341 to date in the UK. In the USA, Bond was defeated to the #1 spot by "Happy Feet", an animated film about dancing penguins. With the Thanksgiving Holiday weekend approaching, the kid-friendly film was shown at more theatres, and due to its much shorter running time, had more screenings per day than Bond. According to BoxOfficeMojo, Happy Feet waddled to $41.5 million from around 5,600 screens at 3,804 sites, including around $2.4 million from 79 IMAX sites over the three-day weekend totals. Casino Royale rolled $40.8 million from 5,100 screens at 3,434 locations, the James Bond franchise still sharp after a four-year hiatus and change in personnel and direction. Distributor Sony said that the audience was 55 percent male and 57 percent over 25. Casino Royale was the #1 film in the USA on Friday, when it opened with $14,741,135 compared to Happy Feet's $12,257,221. Week 2 - Casino Royale scooped $30,785,874 over the Thanksgiving four-day weekend, but failed to take the #1 spot off "Happy Feet", which took $37,038,046 over the holiday. With $94.1 million in 10 days and retaining all 3434 theatres, Casino Royale has sold nine percent more tickets than GoldenEye, the last Bond outing to usher in a new actor, through the same point. Week 3 - Casino Royale collected $15.1 million for $115.9 million in 17 days, and it matched GoldenEye's third weekend drop of 51 percent and held better than The World Is Not Enough and Die Another Day among the previous Thanksgiving-oriented James Bond pictures. In terms of attendance, Casino still trails the last three Bonds, though it is gaining on them and continues to track ahead of GoldenEye, which as the previous franchise reboot is the most apt comparison for Casino. Week 4 - Casino Royale retreated 41 percent to $8.9 million for $129 million in 24 days. The drop was in line with the last four James Bond movies at the same point. Week 5 - Casino Royale is on the heels of Die Another Day in raw grosses. After another decent hold, down 37 percent to $5.6 million, Casino's tallied $137.5 million compared to Die's $138.5 million through the same point, though Casino still trails both Die and Tomorrow Never Dies in attendance by a likely insurmountable margin. Casino Royale dropped to #8 at the US box-office for the week, mostly due to the number of new releases. It went in to its fifth week of release in North America across 2,437 theaters in the USA & Canada - a drop of 724 venues. This reduction was not unexpected, and is less that 007's previous outing "Die Another Day" which lost 1,302 theaters on its fifth weekend - playing at only 2,075 venues and grossing $4,030,346 for the week. Week 6 - Dropping from #8 to #11, Casino Royale took $3,143,720 over the holiday weekend over 1,588 theatres, bringing the US total to $143,713,120. Week 7 - Casino Royale dropped a place to #12 on its seventh weekend on release, taking an impressive $6,014,342 over the New Year at 1,543 theatres, a leap of 91.3% compared to Christmas weekend. Week 8 - Casino Royale piled on another $3,002,507 in its eighth weekend on release in 1,266	theatres. The total take of $159,837,718 now approaches "Die Another Day's" record of $160,942,139. Casino Royale opened in 3,434 theatres in the USA on opening weekend. Weekend Commencing 15th November (Week 1) - Overseas, 007 was #1 in all 27 countries where it opened, earning $42.2 million from the UK, Russia, India and small territories in the Mideast and Asia. Worldwide, Casino Royale took in $84,241,042 on opening weekends. That's 70% higher than the previous Die Another Day in 2002 and by far the biggest Bond ever. 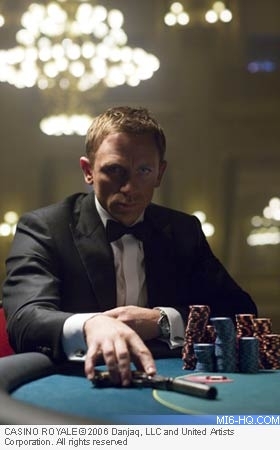 "Casino Royale" biz was also buoyant in Russia - where it took $3.8 million at 633 screens. It set a record in India with $3.2 million at 427 screens, beating "Spider-Man 2"s opening by 87% for biggest debut of a non-Indian film. Greece led the rest of the "Casino" territories with $1.34 million at 111, followed by Thailand with $1.1 million at 154, Taiwan with $1 million at 116, Singapore with $900,000, Malaysia with $800,000, Poland with $735,000 and the UAE with $635,000 -- the second largest launch in that market. Weekend Commencing 22nd November (Week 2) - James Bond's latest mission opened in 18 countries in Europe, where it's now playing everywhere but Italy, and dominated each one. Germany was the top start with $12.5 million from 1,180 screens. That was a franchise high, and Casino Royale accomplished the same feat in France ($9 million from 792 screens), Spain ($3.8 million from 500) and Denmark ($2.6 million from 101). Stellar debuts were also recorded in Austria ($1.7 million), the Netherlands ($1.7 million), Norway ($1.8 million), Sweden ($2.3 million) and Switzerland ($2.9 million) - reports Box Office Mojo. Other holdovers weren't as sterling but were strong nonetheless, including Indonesia (down 23 percent for a $1.4 million total), Malaysia (down 37 percent for $1.6 million), Turkey (down 40 percent for $911,591) and Greece (down 38 percent for $2.8 million). In both India and Russia, it tumbled over 55 percent falls, but that was expected considering its high totals, at $6.6 and $8.4 million respectively. Casino Royale now looks like the biggest Bond ever worldwide, moving up from $82.8m globally last weekend to $222m its second weekend. With many major foreign territories still to go, including Japan, Korea, Italy and Australia, box-office gurus say Daniel Craig will easily blow past the biggest grosser in the Pierce Brosnan series, 2002's Die Another Day, and its $432 mil global take. Estimate is for Casino Royale to make as much as $575 mil globally. Weekend Commencing 1st December (Week 3 )- Spending its third weekend atop the foreign box office, Casino Royale earned $43.7 million from 55 territories, pushing its total to a smashing $195.6 million. Given the far-reaching appeal of James Bond and the lack of significant direct competition, the franchise's 21st installment is poised to lead for several more weeks—December's only worldwide launch will be Eragon. Debuting in Japan, Casino Royale stumbled a bit, making $3.2 million from 443 screens for second place in the market. It was shy of Die Another Day's opening, even though Casino has generally crushed that movie's start elsewhere. Casino's other openings were more in line with its previous potency, including Kenya's $59,403 from 8 screens, Nigeria's $44,016 from 4 and South Africa's $508,899 from 77. Casino Royale's hefty tallies include Germany's $24.2 million ($10,135,944 from the second week of release across 854 venues), France's $15.6 million and Russia's $9.6 million, but it has been particularly impressive in Scandinavia. Denmark, Norway and Sweden added more than $1 million each for the weekend for respective totals of $5.5 million, $3.7 million and $5.1 million. In Finland, Casino is even running ahead of The Lord of the Rings: The Return of the King's mark through the same point with $2.1 million. Weekend Commencing 8th December (Week 4) - Casino Royale topped the foreign box office for the fourth weekend in a row, claiming $35.5 million from 64 territories for a $246.5 million total. James Bond's newest adventure hit ten new markets, setting franchise records in each one, though its highest-grossing country was still the United Kingdom at $5.43 million. Australia and New Zealand were Casino Royale's best new markets with $5.41 million and $836,778 respectively. First-day grosses in Oz of $1.15 million at 405 playdates represented the best opening day for a Bond film in that market. Latin America, where Bond isn't as potent, wasn't as impressive. In Mexico, Casino Royale managed $1.5 million from 564 screens in Mexico, while it grossed $314,002 in Argentina and $320,589 in Colombia. In addition to the U.K., Casino's solid holds included Germany's 36 percent drop (for a $31.3 million total), Denmark's 29 percent drop (for $7.5 million) and the Netherlands' 21 percent drop (for $4.8 million). Weekend Commencing 15th December (Week 5) - Falling to second place overall but holding the top spot in over 13 markets was Casino Royale. The weekend marked the first frame in five in which the foreign box office wasn't topped by "Casino Royale," which showed impressive holdover power in leading the rest of the pack with $20.4 million at 7,090 in 64 markets for a $279.7 million total - surpassing Die Another Day to become Bond's highest foreign grosser yet. Casino had two No. 1 debuts: Brazil's $1.3 million at 361 venues and Uruguay's $18,133. More impressive, though, was the picture's remarkable five-week totals in Denmark ($8.8 million), Germany ($35.7 million), Finland ($3.4 million) and Spain ($10.4 million). Germany posted the top figure, with $3.2 million at 1,070 in its fourth frame, followed by the U.K. with $2.95 million at 793 in its fifth weekend for an $85 million Brit cume. "Casino" posted 44% declines in Australia with $2.9 million at 401 in its soph sesh and in France with $1.6 million at 680 in its fourth frame. Casino Royale slipped from the #1 spot in Canada for the first time since the film went on general release in the country on November 17th 2006. Daniel Craig's debut outing went straight in at #1 at the Canadian box-office and remained there until this week, when it slipped to #3. The 21st James Bond film's performance in Canada has been stunning, holding on to #1 for four consecutive weeks. It has taken over $18 million CAD to date. With Italy and South Korea yet to open, "Casino" is already the biggest Bond pic overseas, with $280.3 million, topping "Die Another Day" by $9 million, and has cumed $418 million worldwide -- only $13 million short of "Die." Weekend Commencing 22nd December (Week 6) - "Casino Royale" shot past the worldwide record for a James Bond movie, thanks mostly to strong international performance over the Christmas holiday weekend. Sony's "Casino" cashed in overseas with $15.4 million at 6,300 during the weekend, then added $4 million more on Christmas Day to push foreign cume to $309.3 million -- the 41st biggest international gross of all time. It's only the fourth 2006 pic to clear $300 million, joining "Pirates of the Caribbean: Dead Man's Chest," "The Da Vinci Code" and "Ice Age: The Meltdown." With domestic gross near $144 million, "Casino" has a worldwide total of $448 million -- $17 million better than "Die Another Day," the previous best Bond performer. It opened solidly in South Korea with $2.3 million at 350. New openings for Casino Royale included South Korea, with $3.8 million at 347, and in Hong Kong, with $1.3 million at 105. "Casino Royale" became the 5th top grossing film in Germany during 2006. "Casino Royale" continued to perform in France, bringing the nation's cume to $18 million. Weekend Commencing 29th December (Week 7) - Grabbing an estimated $15.8 million from 70 territories, Casino Royale fell to fifth place and pushed its total up to $337 million. Over the holiday weekend, the James Bond picture played best in the U.K., grossing $2.8 million in its seventh weekend, up 40 percent for a phenomenal $94.7 million total. It surged 15 percent in Australia to $2.2 million for an excellent $17.2 million total, but has disappointed in South Korea, where it tumbled nearly 50 percent in its second weekend for a $5.5 million tally. Weekend Commencing 5th January (Week 8) - Casino Royale surged to $17.8 million over the weekend for a $371.2 million total, reinvigorated by Italy. Ranking first, the new James Bond opened to a potent $4.4 million from 425 screens, bettering Superman Returns and Mission: Impossible III. Remarkably, Casino still made more than $2 million in both Germany and the U.K. for respective market tallies of $46.6 million and $98.9 million. Soon, it will become only the third movie in the U.K.'s history to gross more than $100 million, joining Titanic and The Lord of the Rings: The Return of the King. *As of January 12th 2007. All figures quoted in US dollars.